Stop spacing is a powerful service-planning tool with relevance to both travel time and coverage goals. Consolidating existing stops is not simple, but converting a route from numerous low-ridership stops to better spaced, higher-capacity stations achieves the benefits of stop consolidation and accessible boarding at the same time. Switching from stops to high-quality stations can serve to balance walking time and on-vehicle time, with benefits for both travel time and reliability. Prominent, attractive stations with elements like platforms and shelters are easier to construct when investments are concentrated in a smaller number of stops. Stops can become recognizable stations that anchor the transit service in a place. Stations can be mobility hubs, attracting riders from a larger area with bike share, bike parking, and car share service integration. Local services with eight or more stops per mile are prime beneficiaries of stop consolidation. Scheduled reconstruction projects are opportunities to include stop consolidation and upgrades, vehicle procurements, and improvements to the pedestrian realm. New vehicles, especially when procured to meet accessibility standards or to provide rapid service, provide an opportunity to install platforms and consolidate stops. Longer station spacing reduces dwell time associated with making more frequent stops; fewer stops allow faster and more consistent travel times, improving service quality for passengers and service cost for agencies. Savings can be used to reduce route cost or increase service frequency. Eliminating one stop, even if passenger boarding takes longer at other stops, can save 15 seconds or more, with additional savings if a pull-out stop and re-entry delay are avoided. Paul Ryus, et al. “Ch 6, Bus Transit Capacity.” Transit Capacity and Quality of Service Manual, Third Edition. TCRP Report 165, Transportation Research Board (2013). More prominent stations reinforce the existence, permanence, and legibility of the route and its identity as part of a broader transit system. Larger stops can accommodate more passengers with better amenities. Higher pedestrian volumes accessing transit stations reinforce safer pedestrian conditions, especially when sidewalks and crossings are upgraded. More robust station-stop design can allow for faster boarding with level or near-level boarding and off-board fare payment. Noise and air pollution are reduced when vehicles stop and start fewer times. Stations allow space used for stops to be restored to other curbside uses, such as vehicle and bike parking, green infrastructure, or parklets. Set stop spacing based on goals for the route. For general applications, convert to a pattern of stops 800 feet apart for local service, and 1/4–1/2 mile for rapid lines. Distancing stops evenly along the route enables simpler signal progression planning. In Portland, a 6-8% increase in stop spacing yielded a 5.7% reduction in travel time without affecting ridership. In San Francisco, buses gained 4.4–14.6% increases in speeds upon reducing average stop spacing from 5.9 to 2.5 stops per mile. AM El-Geneidy, et al. Effects of Bus Stop Consolidation on Passenger Activity and Transit Operations. Transportation Research Record 1971, Transportation Research Board (2006). RB Diaz and D Hinebaugh. Characteristics of Bus Rapid Transit for Decision-Making. Federal Transit Administration (2009). When local and rapid services both operate along the same street, more frequent local stops are more acceptable, and rapid stops can be spaced as much as one mile apart. Where local runs alone for long corridors and rapid service is unlikely to be added, consider 1,200–1,400 foot spacing. Stop spacing for local services of more than 5 per mile can be useful when most passengers are going short distances. 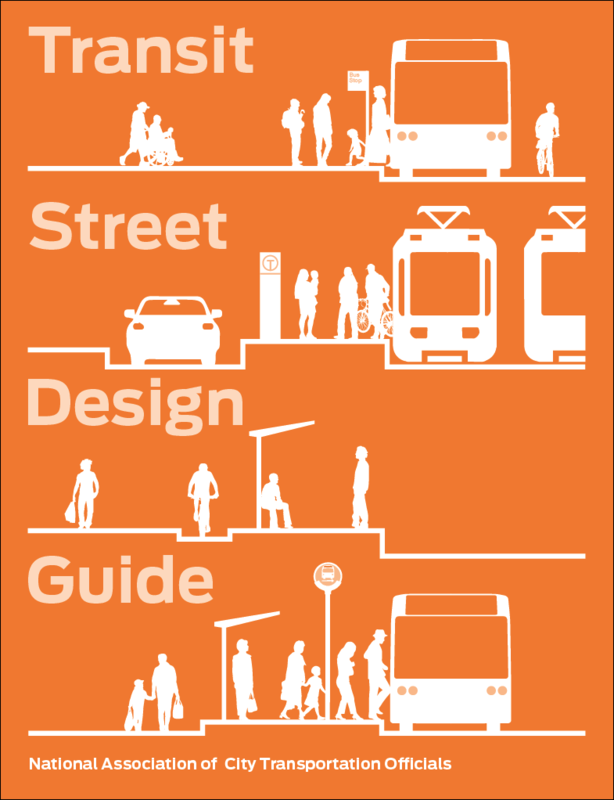 These conditions are often met on short routes, in retail and entertainment areas, where substitutes for walking are a primary reason for the service, or where design and street conditions render the delay caused by stops less relevant. Adjust stop spacing to the street grid and the surrounding transit network, especially reducing the distance to transfers. Transition from making stops on demand to stopping at every station. Predictable stops and dwell times simplify service and trip planning. Pair stop consolidation with station investments, including near-level boarding platforms, high-quality shelters and seating, green infrastructure, bike parking, bike share, and real-time passenger information systems (see Stations & Stops and Stop Elements). Prioritize near-level or level boarding and comfortable waiting areas that do not block pedestrian through movement. Universal design enables more comfortable use for all passengers, including those with disabilities, and speeds boarding and alighting while easing the demand on operators. All-door boarding (which can be supplemented with off-board fare collection) reduces dwell time. References for From Stops to Stations: 2 found. Beaton, Eric B, Bialostozky, Evan, Ernhofer, Oliver, Orosz, Theodore V., Reiss, Taylor, & Yuratovac, Donald. "Designing Bus Rapid Transit Facilities for Constrained Urban Arterials: a case study of the Webster Avenue BRT running way design selection process." New York City Department of Transportation, Transportation Planning Board 2013 Annual Meeting, Washington, DC.